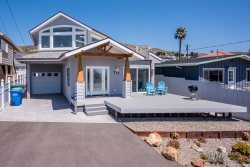 This unique 2 bedroom, 2 bath home is on Ocean Front Walk; literally a few steps to the sand, in the heart of downtown Cayucos! This great location offers immediate access to the pier, locally owned shops and restaurants. The open floor plan and high cielings offer a feeling of spaciousness. Enjoy terrific ocean views from the living room, dining room and kitchen. A cozy private deck is located off of the dining room. High end details include a kitchen island with granite counter tops, a cast iron stove top, stainless steel appliances and a granite breakfast bar that seats 4. If it's cold, snuggle by the gas fireplace and watch the waves. Both bedrooms have a queen sized bed. Master bedroom has an attached "sitting/reading area" with a twin sized day bed and an en-suite bath. The couch in living room pulls out into queen sized bed. Large shared garage available for tenant use to store your vehicle, bicycles, surf boards, wetsuits, etc. The garage is shared with an adjacent locally owned business. Please note, you must walk up a flight of steep stairs (there are 21) to get to the front door. Once inside the home it is single level.